“I’ll be the first to admit, we didn’t coast — there were obstacles and challenges along the way,” he says. Among them: adjusting the business to the changing demographics of the neighborhood. “It’s transient here now. Customers we thought would be long term have come and gone,” he says. 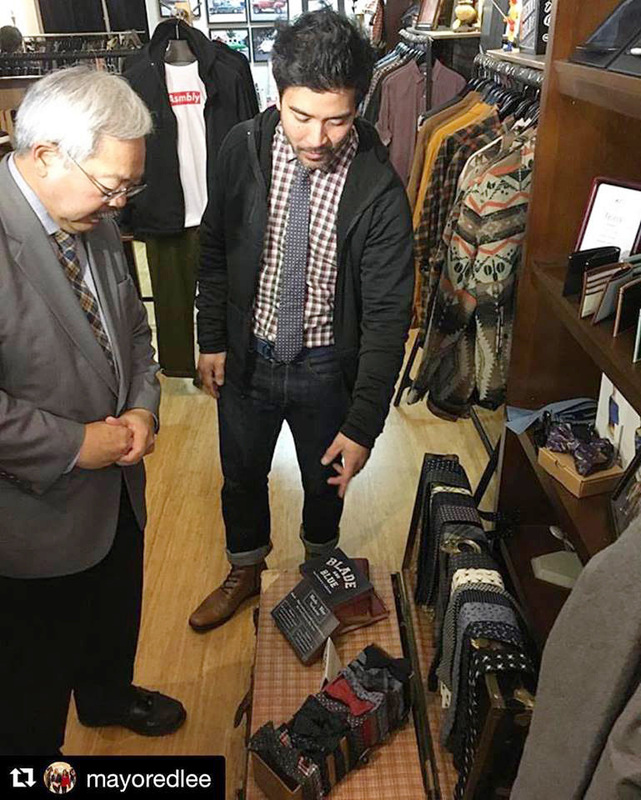 The couple also had to tweak the original notion of offering only locally made goods — although more than half of Asmbly Hall’s offerings are still manufactured in San Francisco. They continue to buck the newer conventions, not only with the shop’s vintage decor, but also by maintaining lower prices than many of the Fillmore boutiques. You won’t find strollers and juice boxes strewn about most of the street’s sleek new boutiques. But they’re part and parcel of Asmbly Hall, where Harlow — not yet two years old, but already a budding fashionista — spends most of her waking hours under her parents’ watchful eyes. 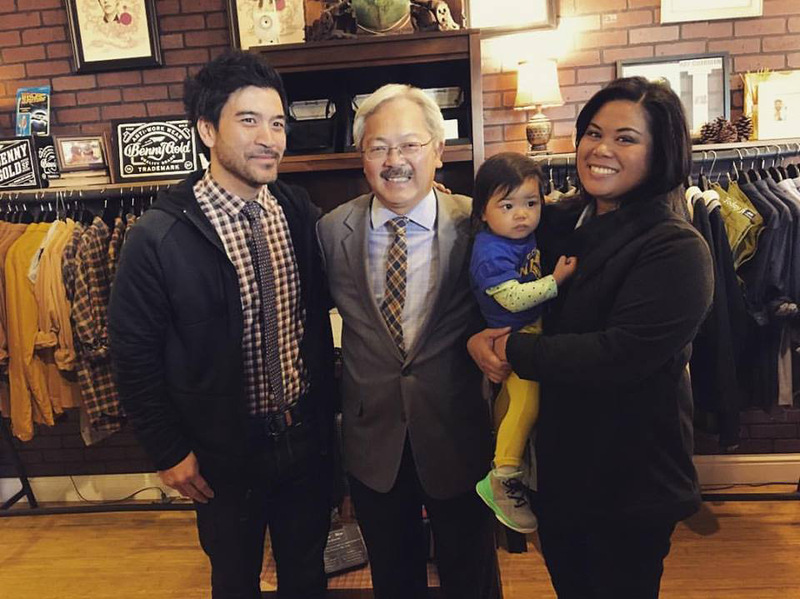 Mayor Ed Lee with Asmbly Hall owners Ron, Tricia (and Harlow) Benitez. They’re also stepping out with a new line: private label tees, shirts and outerwear offering “the Asmbly Hall flair and twist.” They’re starting first with items for men, who quickly proved to be more loyal and easier to define. “We’ve also discovered our clothing is timeless. Our typical male customer has been in the work force for some time and cares about quality, good fit and design,” says Ron. He adds that male shoppers often do something women rarely do: buy clothes without trying them on. The couple also has plans to add another natural: children’s clothing. An online business added three years ago now accounts for about 20 percent of their business. But asmblyhall.com acts mostly as a catalogue for the shop, with some customers perusing it before they come in so they can shop more efficiently. “What continues to be important and keeps people coming in — and keeps us authentic — is that we invest in the customers. We know their kids, and whether or not they’re locals or tourists,” says Ron.